There is now considerable unanimity that international organizations such as the United Nations, the World Trade Organization (WTO), Bretton Woods Institutions and the international economic architecture need to be reformed in order to achieve greater democratic governance to tackle the myriad of challenges facing the world. Written by leading members of the international community under the auspices of the World Forum of Civil Society Networks - UBUNTU, this book provides a diverse and rich resource on all aspects of the reform of international organizations. 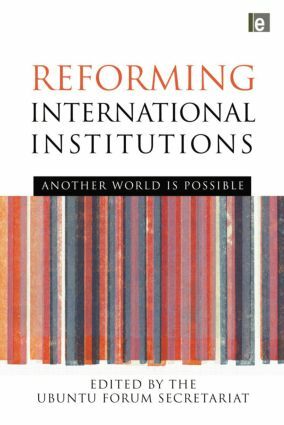 The book introduces the reader to the main organizations of the international multilateral system, presents proposals for reform and provides an analysis of the political action required to achieve global democratic governance. UBUNTU is the World Forum of Civil Society Networks. Its main objective is to build bridges of dialogue and communication amongst national and international institutions which are focused on promoting peace, endogenous development, dignity and human rights..